Bandstop filters may be used to reject or attenuate unwanted signals in a transmitter or receiver. They can consist of just a series or parallel tuned circuit resonant at the frequency of interest as shown below in 1. or more complex types designed to provide increased attenuation or cover a range of frequencies. An example PC layout of an IF reject filter based on 2. above with values for 9MHz and 39.7MHz may be downloaded from here. Each of the above single section filters will provide maximum attenuation at the resonant frequency of the respective tuned circuit. Atternuation will depend on the Q of the tuned circuit and the impedances of the surrounding circuits. 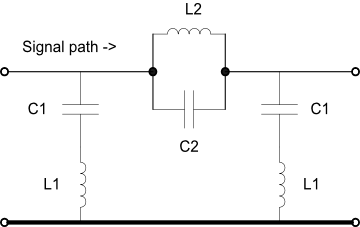 The following circuit provides a much higher attenuation than does the single section filter.